One of the things readers often comment on is the amount of nursing detail I have in my stories. I’m thrilled to hear this as I do put a great deal of time and effort into getting the procedures Millie and Connie undertake right. Although I’ve been a district nurse for over 25 years you’ll appreciate that how I worked during my time on the district is very different from the limited drugs and equipment Millie and Connie had at their disposal. 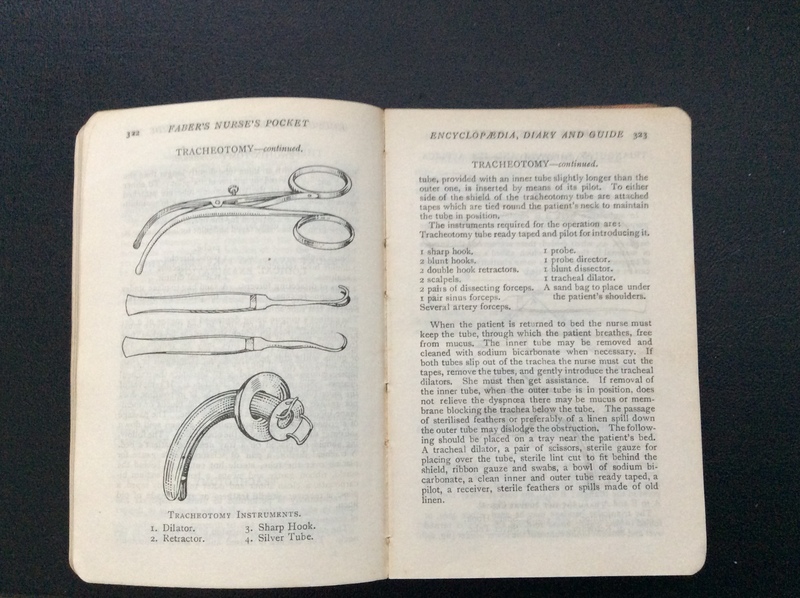 In order to get the detail right I have collected over the years a number of nursing text books of the period. 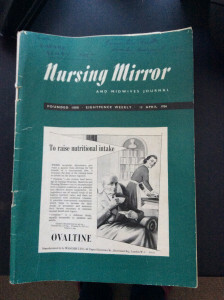 These include nursing and midwifery dictionaries, child health books, contraceptive manuals, nurses’ exam crib sheets, 1940/50s editions of the Nursing Mirror and midwifery text books. 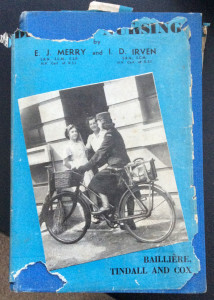 These are all invaluable but the pride and joy of my collection is my 1947 edition of Irwin and Merry District Nursing manual. 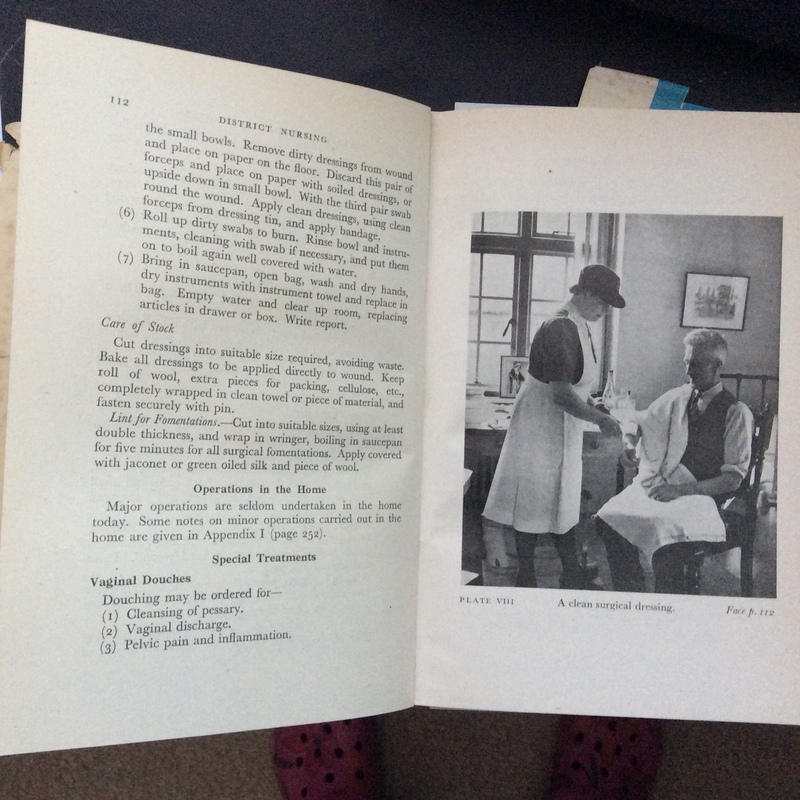 This text book would have been Connie and Millie’s bible as far as their day to day work but also has a detailed account of how a pre-NHS nursing association was run. The ledgers Miss Dutton used and the way Connie had to order supplies is taken directly from the manual as you can see from the image. You can also see I the other picture how Connie and Millie would have laid out the dressing equipment. It also gave me an insight into the understanding or actually lack of it as in the section dealing with nursing assessing and collecting payment for their visits. The midwifery side of Connie job was slightly more of a challenge because I am not a midwife. Not only did I have to get the technical side of delivering a baby right but I had to keep it true to the period. 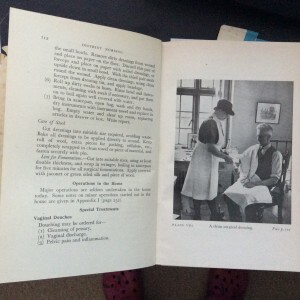 One of my first shocks was to open a 1940s midwifery text book and find X-ray image of babies in utero. If you go into any X-ray department you’ll see huge poster in multiple languages asking you to tell the technician if you’re pregnant but the link between X-rays and leukaemia wasn’t discovered until the 1960s. 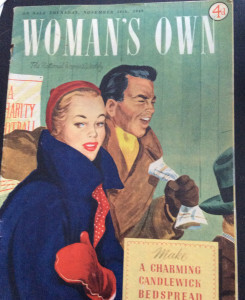 Although there are whole chapters devoted to turning miss-alighted babies and manoeuvres to assist breach infants. 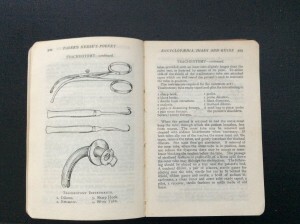 There is a surprising lack of reference to Caesarean section in the midwifery manuals mainly because it was the very last resort, which also accounts for a whole section on death of the foetus just before or during labour. This recommends something that would never be done today which is the removal of the newborn before the mother can see to reduce her distress. There are other things too like observing the link between older mothers and Down’s syndrome but not knowing why and the belief the rubbing surgical spirit on someone skins would prevent bed sores. However, my favourite is the telling little paragraph which states: ‘The New National Health Services Act will, when it comes into force, probably abolish direct payment from patients to nursing assocations’ showing quite clearly that even through the NHS bill had been passed the nursing profession didn’t fully appreciate the massive change it would make. I’m very fortunate that with every new book i write I can take and other little peek into nursing and social history. Just found your blog Jean and it is so interesting. Imagine giving babies X-Ray’s! I have been wondering what it is about the 1940’s and 1950′ era’s It is an era for historical novels that has never gone out of fashion. which is unusual as a lot of era’s become written about and then come back with something new and fresh. Thanks for dropping by, Charlotte, and for me every book is a history project.